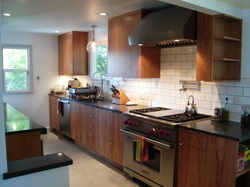 This kitchen was remodeled in the fifties with built in place birch ply cabinets. The owners loved the look and functionality of the existing cabinets, but needed desperately to update and modernize and were ready to add functionality and beauty to their home. The existing cabinets were modified to accept the dishwasher and larger range hood. New cabinets were built to match the old ones and installed to complement and complete the original kitchen. The existing cabinets were stripped and refinished by the homeowners who also finished the new cabinets, staining them as necessary to get the new birch to match the old. The result is a thoroughly usable and enjoyable, beautiful, functional space with two sinks, an open burner range, and exquisite absolute black countertops that retains all of the charm of it's mid century remodel. while alluding to the home's earlier origins. This started as what could be described as a problem kitchen. 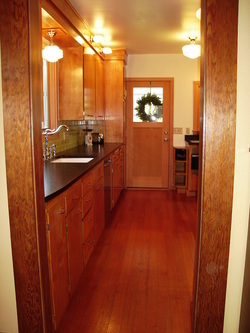 A long, skinny "galley" style kitchen that also has to serve as the passage way to the basement and back boor. By switching to under counter refrigeration and removing the wall between the kitchen and dining room, we've made the whole space fell and function much better. Click here or on the photo for more! 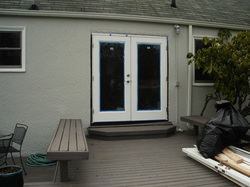 Frustrated with a patio door that was splitting, swelled and very difficult to open, the owners of this West Seattle home wanted something that would look and work the same, yet require much less maintenance while being much more durable. The solution? A pair of custom sized fiberglass doors. Click here to see photos of the installation. 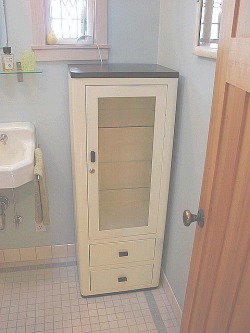 The owners of this home in Normandy Park were never happy with the shallow hall closet the original builder had put in adjacent to the 1st floor bathroom and wanted instead a generous linen cabinet (15" x 25" interior dimension). 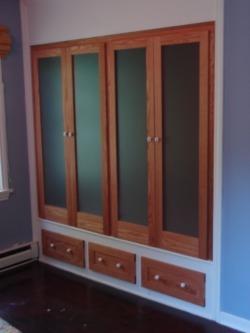 The cabinet doors and face frame are cherry, built and finished on site by LScarpentry. 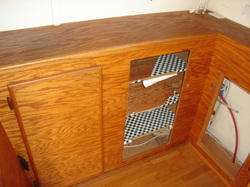 The interior features prefinished maple paneling and adjustable shelves. Click here to see more photos of this project. This small bathroom was needing a redo. 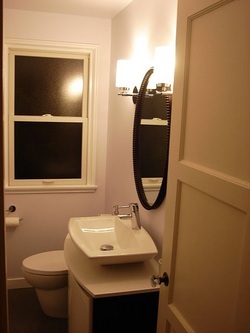 It was cute before, with wainscoting and a pedestal sink, but harder to keep clean, with less storage and fixtures that were starting to fail. The homeowners chose a more contemporary approach and used subtle colors to make the space visually more open. Little changes, like reversing the swing of the door, or cleaning up sloppy drywall or trim details can make a huge difference in such a small space. Adding a vanity cabinet and a built in wall cabinet gave much needed storage space, and along with the bronze framed mirror, provided the perfect dark accents to balance and ground the light, airy feel of the room. Our clients were having trouble accessing their beach front property. The hillside is steep and very slippery when wet. 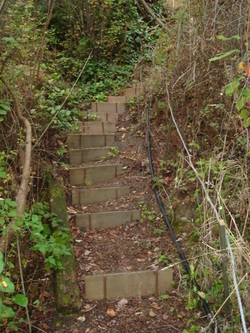 The terraced steps were uneven, and required maintenance each year to combat the brush and erosion. By framing up a new stairway with consistent treads and riser heights and two handrails out of pressure treated materials, we will be able to provide safe, easy and virtually maintenance free access to the property throughout the year. Click here or on the picture to find out more. The owners of this houseboat have an antique cabinet that simply doesn't fit in their small space. 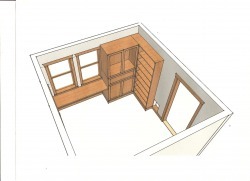 By removing a section of this built-in cabinet and adding a couple of shelves above, we'll be able to increase the efficiency and aesthetics of the space while preserving the look and feel of the original cabinets. Click here or on the picture to see more. An awning for a tight spot. The owners of this houseboat invested in this beautiful new fir door to replace a badly weather beaten unit that had begun to fail. 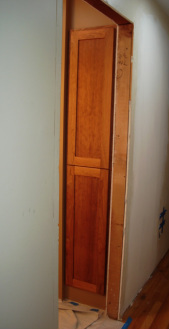 In order to prevent the new door from following the old, a little more coverage was needed. Due to the tight space involved, it was necessary to custom fabricate an awning to fit our needs. Lighten up and loose the blue! 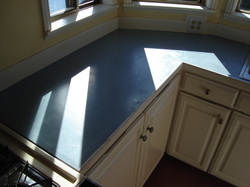 The homeowners were sick and tired of looking at these well worn old Formica tops with their chipped and peeling painted edges. Click here or on the picture to see how it turned out. 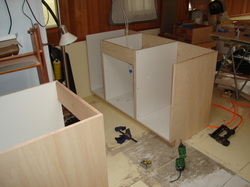 Come inside to see how we set up to build all the cabinets for the houseboat right on board. Click here for more photos! 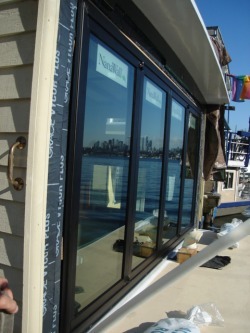 Progress shots of the preparations to install a NANA Wall System on this houseboat, and pictures of the install itself. This project was begun back in June, then the NANA Wall was ordered and the owners went to Europe. Now they're back and the boat is getting done! 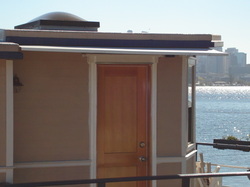 We'll be doing lots of cool stuff to this cute little houseboat, so check back often for updates. The original built in closets in this 1947 home were in bad shape both cosmetically and functionally. Check out what we did to make them look and work even better than new! Click here or on the picture at left for photos of the whole project. These clients had a crooked old fence staggering across their front yard, completely distracting from the view both from and of their home. Having invested so much time and energy into making the home into what they wanted they decided it was time to do something about that fence. I was able to straighten the existing posts to bring them into a straight line. 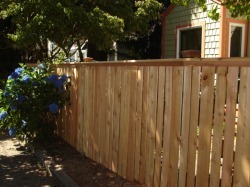 The old fence boards were removed, scrubbed clean and reused on the new section we added at the side of the property. Really wish I had gotten some before pictures of this one. 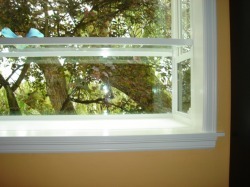 A challenging installation due to it's size and location, this garden window made a huge and dramatic change of view! Click here or on the picture for more photos. The current project should end up looking something like this. Stay tuned to see how it turns out! Click on the sketch or here to see more pictures. 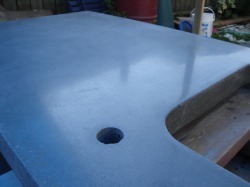 Check out these shots we took of our concrete counters being made by clicking here or on the photo. Leigh got this on eBay several years ago, I think as an excuse for a road trip. We sort of started to refinish it, then moved on to other things. Click here or on the picture for more images.